We have several choices when it comes to kitchen manufacturers. Pronorm are a world renowned German kitchen manufacturer offering a beautiful and highly engineered product. The exclusive Y-line handle profile has a sleek detail on the inside lip of each of the doors. Pronorm are the only german company to offer this. 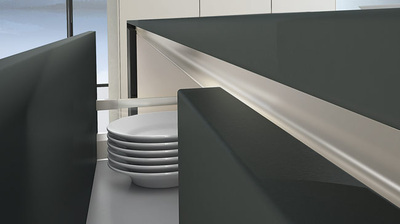 The handleless rail can also be colour coordinated to the door colour or can be a contrasting colour. The handle-less aluminium kitchen rail is routed out within the cabinet itself, providing a space to place your fingers behind the door or drawer in order to open. This completely removes the need to have a handle protruding. Even integrated dishwashers, washing machines and fridge freezers can have the handle-less rail integrated for a particularly clean line. As if Pronorm do not offer a huge enough choice of doors, we also offer a fully bespoke service in the German kitchen style. Matt lacquered slab doors are available in any RAL colour. We also have the choice of any GLASS door finished in any RAL colour and having the finish in either gloss or matt. This gives you endless possibilities in colour combinations. Want even more choice? Try coloured rails to introduce a splash of colour. How about introducing a bold colour or wood grain. Egger have the very latest in wood grain next generation laminates. We can provide handleless kitchens in any of the Egger 18mm ZOOM range of laminates.